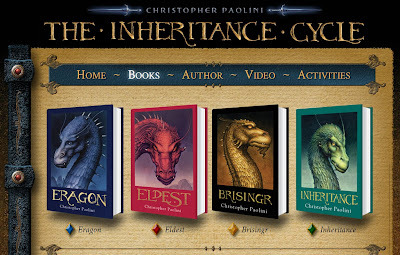 I just finished the last book in Christopher Paolini's Inheritance Cycle. The four books tell the story of Eragon and his dragon Saphira, and their quest to overcome an evil overlord. The books are aimed at the 'young adult' audience and I'd originally bought them for my nephew, but I decided to read them too so that we would have something else to talk about. I found myself enjoying the books as much as my nephew did. I approached them as pure entertainment, rather than being anything deep or life-changing. I could tell how much I enjoyed them because I did genuinely want to carry on, I looked forward to going to bed each night and getting through a few more chapters, which is undoubtedly a good thing. Don't read on if you haven't read them but intend to, there are spoilers. This is the 'genesis' novel - how the protagonist Eragon begins his adventures. Eragon is a dragon rider (his name is one letter shift away from 'dragon') and his growth in this novel keeps you reading. As with all the books in this series there are twists in the plot and action scenes that sustain the narrative momentum. It's worth mentioning that I've read a number of criticisms of the book (and the series as a whole) as being derivative of Tolkien's Lord of the Rings, or the original Star Wars films. The central plot may resemble that in other works, but that is part of the point I suspect - it's what makes it feel familiar and comfortable, matching some expectations and foiling others. If you take a handful or horror books, or thrillers, or detective stories, you will also see similar plots and story ideas. It is the execution and details which make them different. In which Eragon increases in power. The section with the elves was very long, but on the whole I felt that it was justified and added depth to the world and characters. I enjoyed Eragon's adoption of elves' ethical stances on other life due to magic affecting the empathies and psychology of the race (though it disappeared after this book!) The end of the book really took things up a notch and made a welcome contrast to the chapters before. Exciting battles and a big plot twist are good ways to finish a novel! I felt that this took things up a notch from the last book in terms of action. There are quite a few set-pieces, and the novel opens with an important and dangerous mission. The main flaw for me was subjective, but I was irritated by Nasuada's decision to have Roran flogged (and his acceptance of it). I just thought that was a silly action on all parts. It's hard to believe that morale wouldn't go down when a hero is flogged for saving people's lives and saving a mission from disaster. Well, the story finally came to an end. I really enjoyed this, but not as much as the previous three books. It has all the action and twists you would expect, and they are as satisfying as ever. For the most part I couldn't wait to read more. One of the things that contributed to my lower satisfaction for this book was the long ending. Galbatorix had been presented as a great threat, and it was interesting that he did not appear in the first three books - it leaves you excited about the final confrontation. It's quite some build up! When the confrontation happened it was over more quickly than I expected, and the rest of the book was spent tying up loose ends. Don't get me wrong, the confrontation scenes are good, I just expected it to be longer and more complex after all that build up. Compared to that, the ending did (inevitably) drop a gear in terms of pace and interest. I wasn't convinced by Eragon's decision to leave Alagaesia. He was worried about safety (even though their most dangerous opponent had been bested, Eragon was stronger than ever and had more support than at any other time, and he could build a fortress anywhere). He was also worried that the dragons would eat people's sheep (even though the novels tell us that in the past there were a huge number of dragons being raised and trained, and it was never a problem back then). It feels like a decision made just so that the author can write the ending he wants, not a decision that really makes sense. Also, something I have mentioned above, I have an issue with one of the plot threads. In Book 2 we saw the interesting attitude of elves to eating meat. It made sense for their magic to affect the empathies and psychology of their people. Eragon adopts the view, as we would expect. All logical and believable. Then the strand seems to disappear completely with no explanation and a whole aspect of Eragon's psychology is just dropped, after spending many pages building it up in Book 2, until by book 4 a chapter ends with Eragon ecstatically biting into roast pork bellies with "rivulets of juice running down his chin", and at the end he eats roast boar even when in the company of elves. It just feels like the author tried an idea, decided he didn't like it anymore (or it was unpopular) and phased it out hoping no-one would notice. A few small details in the novels stood out as being a bit strange to me, but not enough to affect my enjoyment. For example, capitalisation seems to be inconsistent. Some races are capitalised (e.g. Urgals) but not others (dwarves or elves); some titles are capitalised (e.g. Riders) but not others (kings). It's strange. Another little detail was the sword Zar'roc - it means "misery" in the "ancient language", appropriate for the sword of the most evil of the Forsworn. Except... the swords get named after the rider completes training. Morzan was a normal rider back then, not an evil one. Morzan wasn't fully evil until Galbatorix corrupted him. So why did he name his sword "misery"? It's one of those things that seems okay on the surface, but bizarre when you question it. Okay, I'll stop being overly critical now, since these kinds of things might have explanations I missed, in which case they are caused by my ignorance. Don't let my pedantic nature imply that the books aren't worth reading, I think they're successful fantasy yarns and will fill many an hour for teenagers and adults alike.